Sunday was the Sampler Guild of the Rockies (SGR) Christmas Tea and stitched ornament exchange. Each table was set up by a member who volunteered to bring 8 place settings. All tables were different and very pretty! 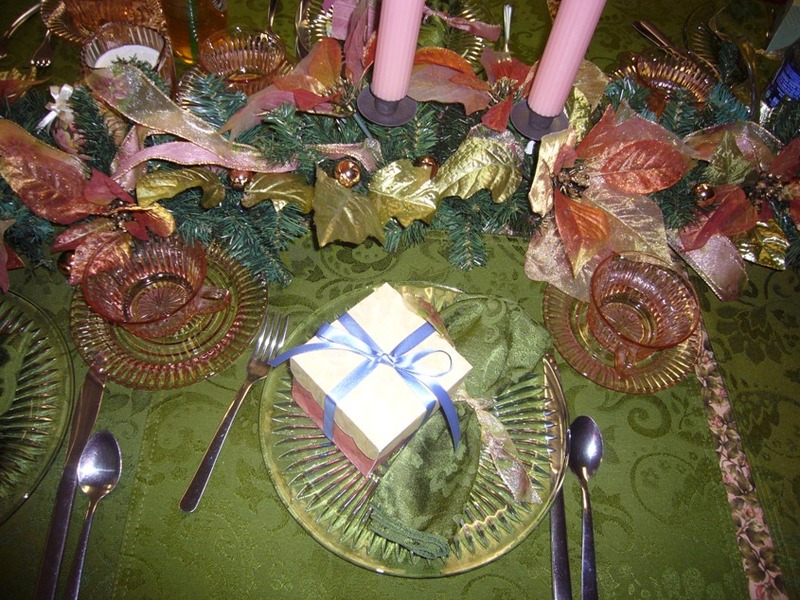 My table consisted of pink and clear Depression glass for the setting, lovely silk poinsettias (pink) and various greens with little glass ornaments sprinkled all about. I took a picture of my place setting before we sat down to eat. We also had an ornament exchange the only rule was that it had to be stitched. Yesterday I posted about the ornament I made and here is a picture of the one I received from Robin a guest who came well prepared and I hope she joins! In the picture below her ornament is on the left and the little white heart at the right was our make and take for the day. I finished it last night and if I want I can take it back in January to put some glitter paint over it. We were given felt with a heart outline and filled it in with buttons and pearls also provided. We had a second piece of white felt, sewed the two together with a running stitch, stuffed it, closed it and cut with pinking shears. Hanger and bow added to finish it off. The make and take was a lot of fun, the food was great and being with fellow stitchers is always priceless!! Sounds like a great time. I have a full report on my Tea and Stitch holiday potluck coming soon.